I recently taught some Christmas Tree Decoration Workshops at Windsor Castle, as part of their Festive Weekend. I was amazed at how popular they were and how much people enjoyed taking the time to make their own decorations. I thought it would be nice to share the instructions on my blog so more people can have a go. So, here goes. Here's how to make either a Mistletoe or Holly Hanging Decoration. Wire (about 1mm thick) I have used garden wire that I have rusted myself - copper wire or coloured aluminium would work well also. A selection of Decorative Papers - I've used a selection of Indian printed papers that I got from Paperchase on Tottenham Court Road in London - but any good-quality wrapping paper would do. Cut out your two leaf shapes then fold each leaf in half lengthways with the patterned side on the outside and then make a crease down the long edge of the paper. (This step isn't necessary if you are using fabric). Now, place the creased leaves (or uncreased fabric) with the plain side uppermost on your work surface and add a blob of glue to one end of each leaf shape. Now cut a length of wire 10cm long. Place one end of the wire on the glued end of one of the leaves so that about 1.5cm is on the paper running along the crease mark that you made earlier and the rest of the wire is sticking out past the leaf (see below). Next place the second leaf under the free end of wire in line with the first leaf and again, stick the wire to the glued leaf along the crease line with about 2cm overlapping the paper. You should now have a piece of wire with a leaf stuck to it at either end a bit like a pair of oars. Apply a bit of pressure to both leaves to help the glue stick, and leave for a couple of minutes before continuing to the next step. Now pick up the wire with the leaves now attached and pinch the wire between the forefinger and thumb of each hand just where the wire pokes out from the leaf. Carefully applying a bit of pressure and move your hands towards each other forcing the wire to push upwards forming a loop. This might need straightening out a bit. Place the decoration on your work surface and add a blob of glue at the top of each leaf - just below where the wire is attached. Now, stick a button to each leaf and leave to dry for about 10 minutes. The last step is to add the ribbon hanging loop. Cut a length of ribbon about 20cm long – see fig (i) and double it up - lining up the cut ends – see fig (ii). Now, holding the decoration in one hand, poke the folded end of the ribbon through the wire loop that you made and open out the end of the ribbon to make an opening and now thread the other end of the ribbon with the raw ends through the opening and push down firmly to knot the ribbon around the wire loop – see fig (iii). 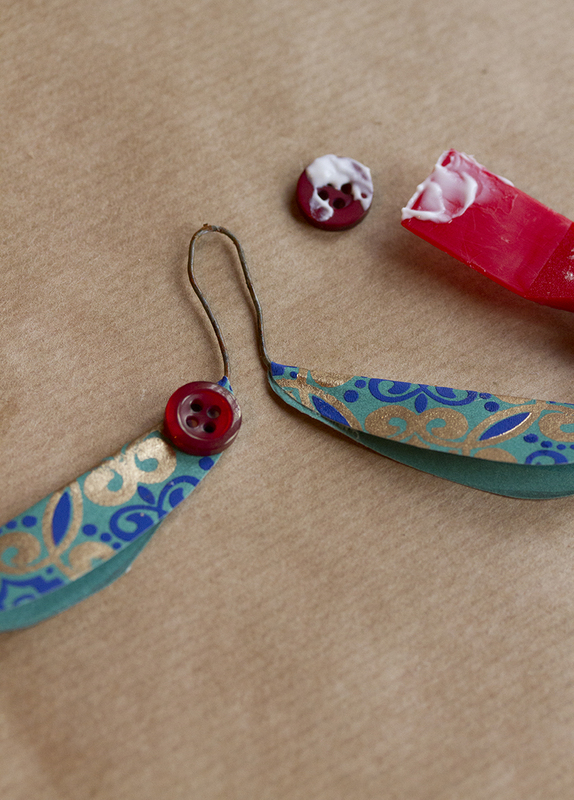 Next make a knot at the other end of the ribbon so that you can hang your decoration up – see fig (iv). You've now finished! You just need to decide where you are going to hang your new Christmas Decorations - on your Christmas tree, from some twigs in a table decoration or in your window - it's up to you.